Christmas Eve is a great night for a lot of appetizers and different foods - nothing fancy, just good, home cooking! Unfortunately this year I couldn't do as much as I wanted since I had pneumonia. We ended up taking food over to my parents' house so they could do all of the work..thank goodness! We contributed two appetizers - my spinach artichoke dip and Jon's boiled shrimp and homemade cocktail sauce. I tried a few different recipes and finally created my own. Believe me, if you make this one, it will be the best you have ever tried. Cook spinach according to package directions; drain. Add mayonnaise, sour cream, cheeses, red pepper flakes, and salt. Mix well. Serve with tortilla chips and/or raw vegetables such as carrots and celery. 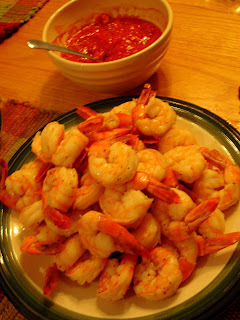 It is a tradition in Jon's family to have lots of shrimp on Christmas Eve. Jon loves this tradition - it's another excuse to make shrimp! Add 2 lbs of shrimp to the boiling water. Cook until firm, approximately 7 minutes. Remove from the water and toss under cold water to stop the cooking. Cocktail sauce: Jon mixes ketchup, horseradish, Tabasco, and Worcestershire sauce to make his cocktail sauce. Whew is it spicy!! I made this for New Year's Eve and it was a huge hit. It was fabulous! Thanks for sharing! I will keeping this recipe for future use. Approximately how many does this dip serve? Looking forward to making it! Hi! This dip served 6 plus leftovers, and we ate a lot of it!! I made it again last week and it served 7 with leftovers. 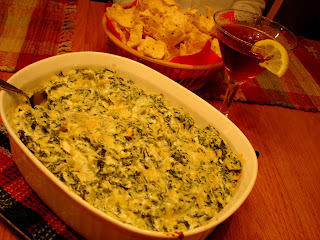 Every time I make this recipe for Spinach Artichoke dip, people RAVE. And then ask for the recipe. It is the best!